Life in a Group Home: A day with my favorite boy! Since we had training every day last week, I wanted to do something fun with Joshua on Saturday. After he went to swim team, we headed into Kansas City. 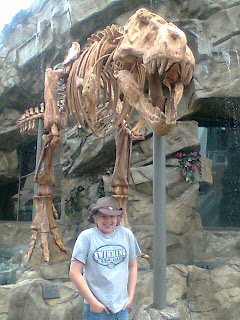 We went to T-Rex Cafe, which is like Rainforest Cafe, but with dinosaurs instead of elephants and gorillas. It would have been his favorite place in the world when he was four, and he seemed to think it was pretty cool even at twelve. It was loud. Dinosaurs were roaring all through the meal, so it isn't the best place to go if you are looking for atmosphere for good conversation. But it was fun, and the food was actually excellent. After checking out all of the dinosaurs, we walked around and shopped. It's fun that he is finally at an age where he enjoys shopping. And he isn't quite at the age yet where he doesn't want me to be with him. So it's perfect. Afterward, we went and saw "Paul Blart - Mall Cop" at the theatre. It was so much better than I would have given it credit for. Not that I want to see it again or anything. So not much to report this weekend, except some down time with one of my favorite people in the world.